PHOTO BY RYAN WILLIAMSON Fresh, bottled juices are stocked in the to-go cooler. Monday through Friday, 7:30 a.m. to 7 p.m.; Saturday, 8 a.m. to 5 p.m.; and Sunday, 9 a.m. to 2 p.m.
Just Juice, in early December, opened its new location on University Avenue — down the road from its former spot in the M/Body Fitness building — a chic little joint designed by Lives Styled to feel like a balmy oasis, with seating and counters by Staach. 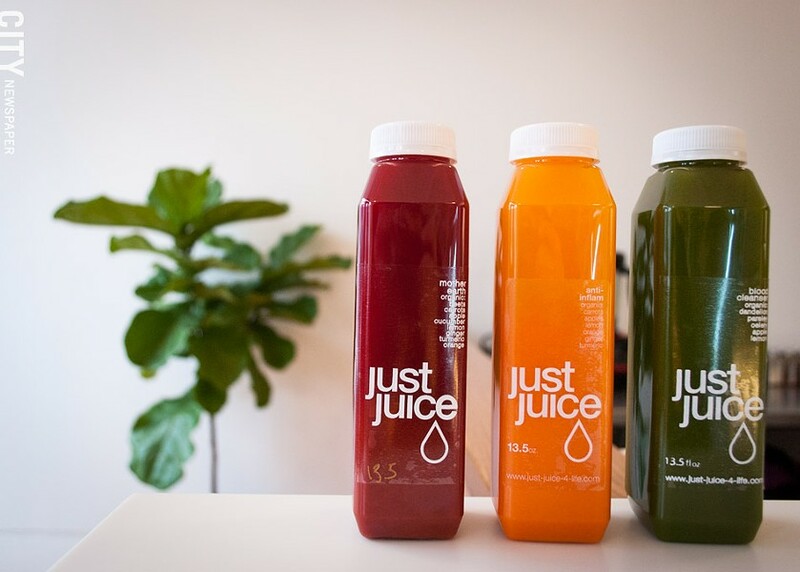 Just Juice offers personalized juice cleanses as well as a variety of smoothies and other healthy treats. The menu is entirely vegan, gluten-free, and peanut-free, and food processors used for other kinds of nuts are kept separate from ones used for produce. Founder Damaris Pinedo began her career as a cytotechnologist at the University of Rochester Medical Center, screening for cancer and infectious disease, but shifted her focus to nutrition when her cousin was diagnosed with ovarian cancer. "My interest kind of started a little before that," she says, "because I always suffered from digestive issues, endometriosis, and PSO, so I was looking for different ways to heal that are not invasive and actually make you feel good afterwards. That's how I came across juicing — I was just looking for more of a spiritual kind of cleanse. And all of the physical ailments I was suffering from were disappearing, so I knew I was onto something." Pinedo says her research quickly became a lifestyle. "I was benefitting from it, and my cousin was too, so it was something I wanted to share with others," she says. From there it just snowballed. In 2010, she became certified in teaching and prepping raw vegan food, and received her certification as a Holistic Health Coach in 2011 from the Institute for Integrative Nutrition. By May 2012, Pinedo was offering fresh juice from a renovated 1970 Aristocrat camper at the Brighton Farmer's Market, and in 2013 she opened her first storefront at 713 Park Avenue. She moved to the M/Body Fitness spot about two years later. Pinedo says her medical background is a comfort to clients who come to her with specific ailments. In addition to treatment, it's also about proactive prevention of disease, and providing support for your system in the case that it's faced with fighting an illness. "Instead of waiting for that moment where you're put in a position where you have to change everything at one time," Pinedo says, "this is a nice way to gradually start making lifestyle changes. Over time your palate changes and you just crave healthier, cleaner food." Just Juice's menu is as much a result of research into nutrition as it is experimentation with flavor balances. The tastes of certain fruits and vegetables pair well together, Pinedo says, but the pairings also take into account nutrient absorption — for example, it's easier for systems to absorb the iron in spinach when it's paired with the vitamin C found in citrus. Pinedo says she'd start a novice juicer on something a little sweeter, like the refreshing power tonic Kale Ale (which uses kale, apple, pear, cucumber, and lemon), and over time build up to the more bitter and nutrient-dense Green Love (kale, dandelion, parsley, cilantro, celery, cucumber, romaine, green apple, lemon, and ginger). Some of the main ailments that bring people in the door are digestion and skin issues, particularly eczema, Pinedo says. But she's also had clients who are going through cancer treatment or recovery, including two former employees. "Sometimes when people are going through treatment, they're not necessarily physically hungry, but they're still thirsty," Pinedo says. "So I tell people to make it count, what's actually going into their body." 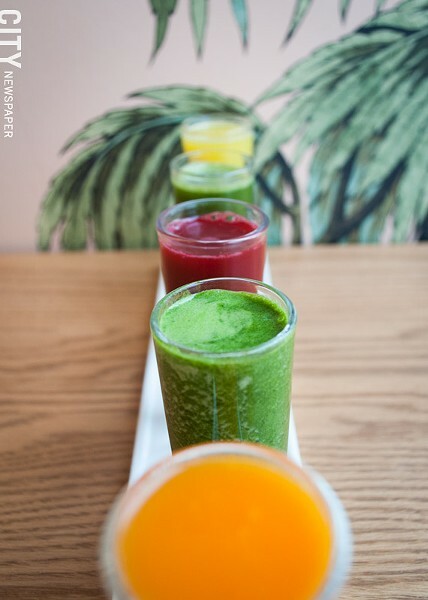 You can sample all five of the shop's fixed menu juices — which includes the aforementioned Kale Ale and Green Love as well as the heat-filled Fireball (orange, apple, cucumber, lemon, ginger, and cayenne), the earthy-sweet Beet It (beets, carrots, apple, cucumber, lemon, ginger, turmeric), and the vibrant Anti Inflam (carrots, apple, orange, lemon, ginger, turmeric) — by opting for the juice flight (five two-ounce shot glasses for $8). 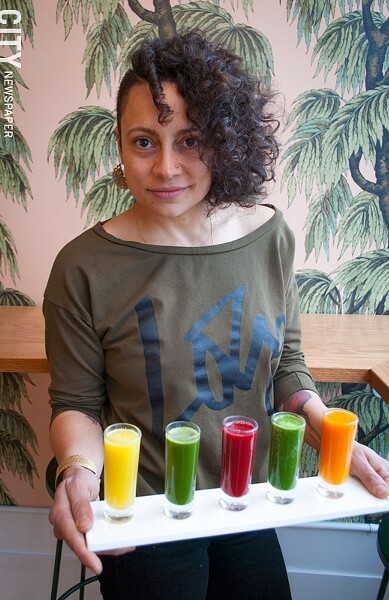 Beyond juice, Pinedo and her team offer one- or two-ounce power shots, including the Wheatgrass ($3 for the one-ounce; $5 for the two-ounce) — using a sweet, rich grass sourced from Thunder Mountain Foods in Bath, New York — and the kicky Lemon Ginger Cayenne ($2; $3). They also offer a variety of seemingly indulgent smoothies, including the Shamrock (banana, cacao powder, peppermint extra, spirulina, coconut, cacao nibs) — seriously, eat your heart out, Mickey D's. Just Juice sources its produce locally as much as possible, and Pinedo has relationships with the Good Food Collective's collaboration of farms, Fellenz Family Farm, Wild Hill Farm, and various farmers at the Brighton Farmers Market. Its fresh turmeric comes from a farm in Hawaii and arrives two days after it's harvested. Pinedo also works with Community Composting to dispose of the fibrous waste from juicing. A to-go refrigerator is stocked with bottled juices and daily specials, which lately has included a Peppermint Cashew Mylk ($6) and jars of kimchi and sauerkraut from Small World Food. Just Juice will open on New Year's Day, and offers an activated charcoal "Black Magic" juice which, Pinedo says, is great for hangovers.